* Off the top it’s spicy, syrupy, and boozy. I’m not sure if I am getting cognac or rum, but it’s robust, strong, and warming at the same time. * Actually, I ran into my kitchen to smell a few fruits and I am getting prunes. Not geriatric prunes, but sweet alcoholic prunes. Okay, so it’s spiced prune rum as the top notes. * The prunes stay present but get less sweet and more dry, even salty, as they are grounded by cedar wood. So imagine pencil shavings and prunes. It sounds odd, but it smells really good. * After about four hours it becomes very much a skin scent, but it will often waft up when you don’t realize or expect it. * The spiced prune note stays present and is joined by a dry leather and a cooking spice that I couldn’t place. 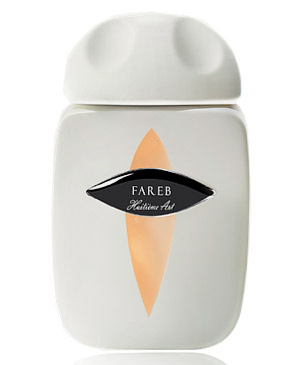 Summary: Fareb is a scent where words don’t do it justice. When I say spiced prune rum and pencil shavings, it sounds really odd and off-putting, but on skin it’s really seductive and comforting at the same time. As an EDP, longevity is average- lasting just about eight hours before it becomes really faint. While this could be worn as an office fragrance (after the first hour passes), I see it more of a nighttime/going out to dinner and then snuggling with someone kind of scent. For the right kind of guy (or girl), it could easily be a signature scent. I would recommend this for anyone who likes the idea of Serge Lutens scents but finds them too strong or intense to wear. Fareb is just as interesting but not as aggressive through the wear. Huitieme Art Fareb is available at Luckyscent. All the way through you had me thinking ‘Serge Lutens’ it sounds just like a ‘Serge’. So I understand exactly what you mean in your final line or two. Personally I appreciate the power of a Lutens fragrance but for someone who finds them to loud this might be just the ticket! I am with you – I like power and darkness — Nasomatto Black Afgano and Illuminum Black Musk are two of my personal favorite scents.